The COST Action PROTEOSTASIS BM1307 is an European network with members from almost all countries in Europe. Its main objective is to facilitate research and collaborations in the fields of Ubiquitin/Proteasome, Ubiquitin-likes, autophagy and lysosomal systems in health and diseases. 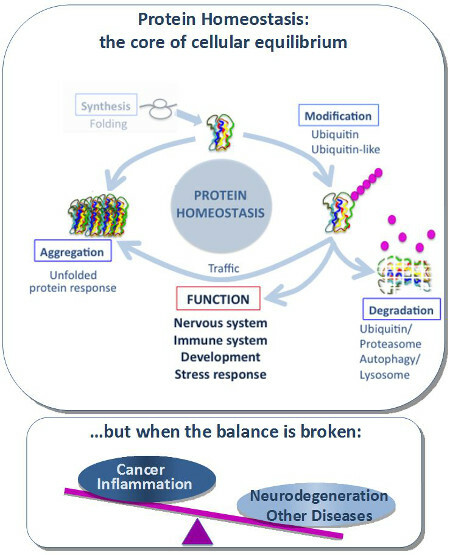 Intracellular proteolysis is not only critical for cell homeostasis but also relevant for many pathologies, such as cancer, immune diseases, neurological disorders, etc… Its role in almost every biological process has generated a huge interest among scientists with quite different backgrounds, which in turn has resulted into both a tremendous advance of our knowledge and an important fragmentation of the field. The Action will coordinate and integrate the efforts made by European research teams to better understand protein homeostasis and to translate novel discoveries into products of clinical and/or economical value. Integrate research on intracellular proteolysis pathways in health and disease. WG1. Protein modification in intracellular proteolysis: mechanisms, roles and regulation. WG2. Intracellular proteolytic systems: mechanisms, structures and regulation. WG3. Regulation of cell signalling. WG4. Protein quality control, misfolding and aggregation. WG5. Regulation of cell proliferation and differentiation. WG6. Molecular bases of diseases, biomarkers, drug targets and biotechnology.